If you are seeking a dark font & color scheme for Netbeans, try out Oblivion Revival. 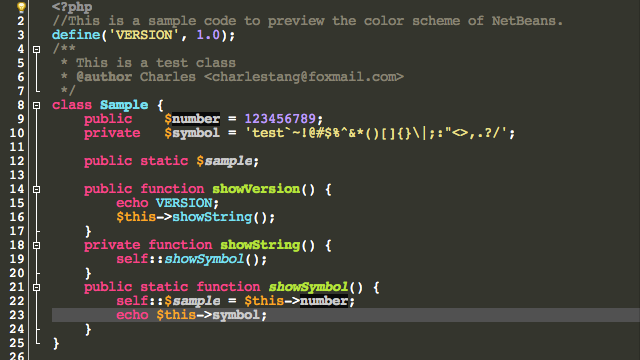 I am use to coding with Notepad++’s Monokai so I dug up two nice Netbeans Font & Color Schemes. Go to Tools -> Options then select Import and browse to the .zip file. Click Okay and restart the IDE! The best theme ever. Smarth, beautiful e guive me more pleasure while I´m programming. Me encanta este tema, yo hice el mio guiandome de sublime text. voy a probar este parece que esta bien configurado. I really like the “Monokai Dark” like it is in Aptana Studio. Or “Amy”. This simple “monokai” is too ‘dirty’ I in my oppinion. Thanks man for your work! It was plenty worthwhile! Best theme for Netbeans. It looks even better with Consolas font! What is the name of the font used for this test ? Awesome theme! Could we get a Monokai theme for nano? 🙂 You got it. Now the link fixed. Maybe this is a nooby question, but could anyone tell me how to remove the red highlighting from errors? it really disturbs my eyes, and I like the rest of the theme.. I’ve tried to find it in fonts and colors, but I cant. The preview image isn’t the same I downloaded, it not looks like Monokai from Sublime. It’s super cool! One of the best color scheme that I’ve ever seen, each color has been chosen carefuly to suit the background color for readability and elegance. And the colors themselves are awesome! Thank you for adopting this Sublime color scheme for use in NetBeans. It motivates people who are evaluating the joy of coding. it work awesome! thank you!